We present a collection of benchmark datasets in the context of plant phenotyping. We provide annotated imaging data and suggest suitable evaluation criteria for plant/leaf segmentation, detection, tracking as well as classification and regression problems. The figure symbolically depicts the data available together with ground truth segmentations and further annotations and metadata. The data can be used by scientists that already work in related fields but also from general computer vision scientists that work in related computer vision problems. 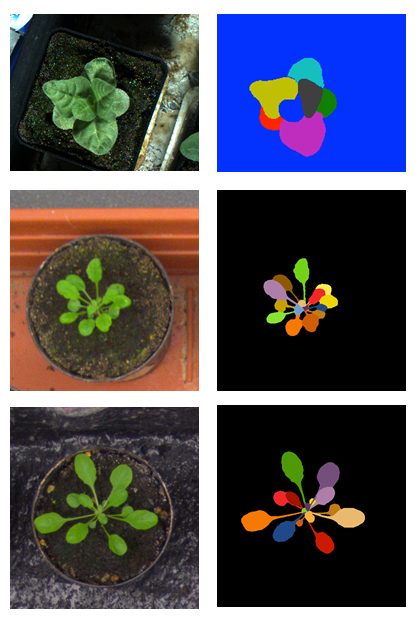 No matter what, testing your algorithms on these data, you help us improve the state-of-the-art in phenotyping and feed the world one image at a time. Over the last years, the dataset has seen a lot of interest and helped not only to improve image analysis solutions, but also introduced plant phenotyping to the broad scientific community. Please see the 'Impact' tab for a more detailed analysis or read our paper 'Sharing the right data right'. The Plant Phenotyping Datasets is available already from our download page. A benchmark suite covering ‘plant detection and localization’, 'plant segmentation', 'leaf segmentation', ‘leaf detection’, and ‘leaf counting’ is also available from there. If you want to be kept updated on the progress of the Plant Phenotyping Datasets, please send us an email and we will keep you posted.